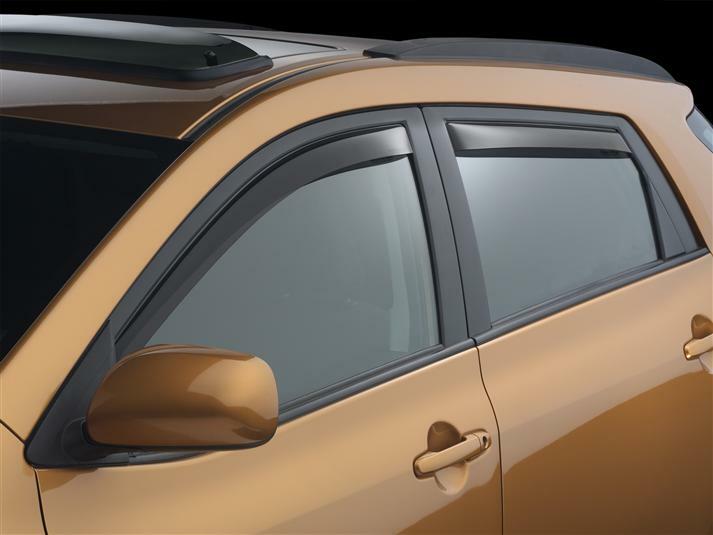 WeatherTech Side Window Deflectors are precision-machined to perfectly fit your 2012 Toyota Matrix's window channel. These low profile window deflectors help to reduce wind noise and allow interior heat to escape. Our light tinted Side Window Deflectors are the only deflectors in the world made with a D.O.T. (U.S. Department of Transportation) approved glazing material. Available in light and dark tint for most vehicles. Designed and Engineered in USA – Handcrafted in Germany. i bought my Matrix 7-08,went to the dealer that I bought the car from in Oct. 08 and wanted to buy side window deflectors. the parts dept. man said I should get Weathertech instead as Toyota's do not stay on and are not as good.Waited 7 months for them to be R & D. Worth the wait. Easy to install, look good and keep the weather out. Excellent product. Waitng for my Digital mats. as I write this.